CD Review: Peach Union, "Audiopeach" & Aqua, "Aquarium"
Those Eurobeat dance bands are unstoppable! Seems like wherever you look, some new sequencer-driven group is trying to break into North America and make a splash on the scene. Denmark's Aqua and Britain's Peach Union are two of the latest wannabes that are grabbing for the ears and dollars of our beat-crazed youth. Both feature cute music, video-friendly female lead singers and repetitive digitized rhythms. 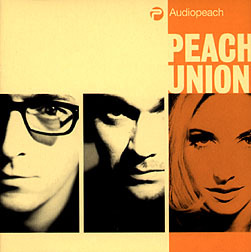 Of the two, Aqua have silly and catchy stuff, while Peach Union have the lyrical and musical profundity. Chances are you've heard Aqua's single, "Barbie Girl," but you might not have heard Peach Union's "On My Own." Comparing the two selections is like comparing apples to, uh... peaches. 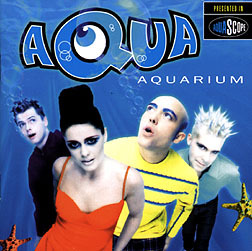 I thought Aqua's singer Lene Grawford Nystrom was just stylizing her voice for the single, but, no, she really does sing like a whiny little girl through the whole CD! (Actually, she does sound quite earthy on the pleasant ballad, "Be A Man," but it's one song of eleven.) Peach Union vocalist Lisa Lamb has the slim blonde good looks, but she also has an incredibly sweet emotive voice. Especially on "Tell Me" and "Higher Ground," she effortlessly climbs the octaves and delivers oh-so-soothing phrases. She's backed by some pretty sophisticated keyboard layering that make for very enjoyable hypnotic tunes. You'll get more bang for your buck with Peach Union, but if you just want to numb your mind with inane grooves and lyrics, Aqua is your best bet.